To end last week, the Nexus 6P saw a flurry of discounts from a variety of retailers by as much as $80. If you want a Nexus 6P, hopefully you took advantage. If you missed out on any of those deals, we have a new Nexus-related discount for you today that might be even harder to pass on. 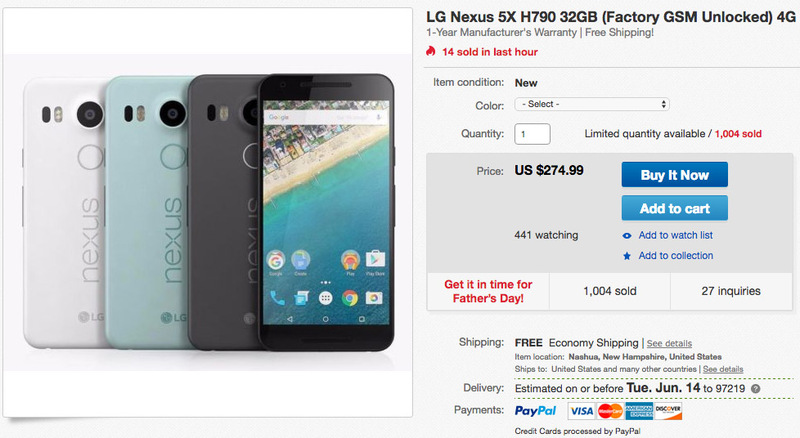 The Nexus 5X with 32GB can be had for $274.99, a discount of $125. The phone is in new condition as model H790, which is the US variant, so you should have no issues taking this to your carrier of choice, including Verizon. Currently, the eBay seller has black or white versions and is offering free shipping.